Since the Yankees last faced Baltimore (all of six days ago), the Orioles changed their manager, firing Dave Trembley and giving the job to Juan Samuel on an interim basis. Luckily for the Yankees — and, really, the rest of the American League — they didn't fire their pitching staff. Credit Nick Swisher (who made the score 2–0 two batters into the game with a home run off Kevin Millwood) and Curtis Granderson (whose grand slam made it 6–0 in the third) and just about anyone who batted in the six-run seventh inning, but few teams are as easy to score runs against than this Baltimore club. Through 58 games, they've allowed 305 runs, more than any other team in the American League. Ever since Baltimore beat the Yankees in the first meeting of the season on April 27, the Yankees have won all nine games against the O's. 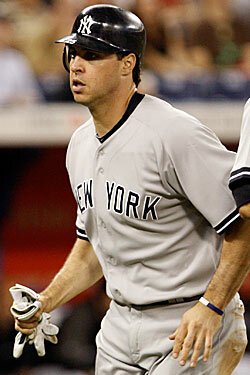 And then there's Mark Teixeira. A day after seeing his face on the back page of both tabloids — mostly because no one in this town played on Monday night, and his slump made for good copy on a slow news day — he went three-for-four with a home run in the 12-7 win. And sure, the home run came with the score already 10–3, but considering the bullpen proved shaky enough in relief of a good-enough Phil Hughes that Mariano Rivera actually had to warm up in this one, every last run counts.